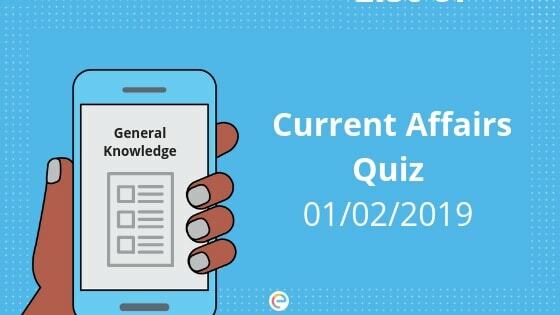 Current Affairs Quiz for February 1, 2019: This section covers the GK and Current Affairs quiz with daily MCQs on National Affairs, International Affairs, Economy, Banking Affairs, Polity, Geography, Environment, Sports etc. for competitive examinations viz. UPSC, SSC, Bank PO, Bank Clerk, IBPS, Railways, Government Jobs, UPPSC, MPSC, and other state exams. This current affairs quiz will help you in General Awareness section conducted in various Banking, SSC, Insurance, Railways, and other govt job entrance exams. Current affairs quiz will also help you outshine in the crowd with all the information you gain from this article. 1. Which airlines recently resumed its services from New Delhi to the holy city of Najaf in Iraq after 25 years? Explanation: Air India is resuming its services from New Delhi to the holy city of Najaf in Iraq after 25 years. Indian Ambassador to Iraq Dr Pradeep Rajpurohit said, the services will commence from February 14, 2019. 2. When is the National Martyr’s Day observed in the country? Explanation: National Martyr’s Day or Sarvodaya Day was observed to mark the death anniversary of our greatest Hero and father of the nation, Mahatma Gandhi who was assassinated by Nathuram Godse on 30th January 1948. A cultural programme named “Remembering the Mahatma” was organized by Indian Cultural Centre in Colombo, Sri Lanka. In India, Martyr’s day is celebrated on five days every year to pay homage to the freedom fighters of India. 3. Which State presented its annual budget of Rs 19,548.69 crore for the year 2019-20 on January 30, 2019? Explanation: Goa Chief Minister Manohar Parrikar, who also holds Finance portfolio, presented annual budget of Rs 19,548.69 crore for the year 2019-20 as against Rs 17,123.28 crore for the year 2018-19, representing an increase of 14.16 percent over last year. 4. What was the theme of World Leprosy Eradication Day observed this year in January? Explanation: 30th January 2019, is celebrated as World Leprosy Eradication Day which stresses the need of eradicating the disease. It also brings to light the discrimination and stigma that people suffer from society every day. Leprosy, also known as Hansen’s disease is a highly contagious infection caused by the bacterium Mycobacterium leprae. This year’s theme for World Leprosy Day is ‘ending discrimination, stigma, and prejudice’. 5. South Korea’s Ki Sung-Yeung announced his retirement from which sport? Explanation: Football player Ki Sung-yueng announced his retirement from the South Korean national team. The midfielder though decided to retire after the 2018 FIFA World Cup in Russia yet decided to compete in the 2019 AFC Asian Cup, which held in United Arab Emirates, under the new national team coach Paulo Bento. 6. Which two nations have launched a common digital currency called ‘Aber’? Explanation: The central banks of the United Arab Emirates and Saudi Arabia have launched a common digital currency called Aber, which will be used in financial settlements between the two countries through Blockchains and Distributed Ledgers technologies. 7. Which state government banned the import of pigs and piglets recently due to the possibility of an outbreak of Porcine Reproductive and Respiratory Syndrome (PRRS)? Explanation: The Mizoram Government issued an order to ban the import of pigs and piglets ,because there is a possibility of outbreak of Porcine Reproductive and Respiratory Syndrome (PRRS). PRRS disease is also called as Swine Flu,the virus of this disease generally transmitted from pigs and affects both pigs and humankind. 8. In order to promote domestic assembling of electric vehicles, the government has reduced the import duty on parts and components of electric vehicles too? Explanation: The Government reduced the import duty on parts and components of electric vehicles to 10-15 percent from 15-30 per cent in order to promote domestic assembling of electric vehicles. The new rates came into effect from 30th January 2019. A separate category for parts and components of electric vehicle has been carved out by the Central Board of Indirect Taxes and Customs (CBIC) which attracts import duty of 10-15%. 9. Who is the newly appointed Ambassador to the Republic of Colombia? Explanation: Ministry of External Affairs appointed 1993 batch Indian Foreign Service (IFS) Officer Sanjiv Ranjan as the new Ambassador to the Republic of Colombia. Sanjiv Ranjan was born in 1966 and he holds bachelors in Economics from the University of Delhi and an M.A. in International Relations from Jawaharlal Nehru University (JNU). 10. ISRO and which other company jointly selected 10 companies for transfer of its Lithium-ion cells technology developed by Vikram Sarabhai Space Centre (VSSC) in Thumba? Explanation: The Indian Space Research Organization (ISRO) selected 10 companies jointly with the NITI-Aayog from a list of 141 companies for transfer of its Lithium-ion cells technology developed by the Vikram Sarabhai Space Centre (VSSC), Thumba.